KOREA’S leading engineering, procurement and construction (EPC) contractor eTEC Engineering and Construction (eTEC E&C) has started construction work on Saudi International Petrochemical Company’s (Sipchem) ethyl acetate and butyl acetate plant and port facility project in Jubail Industrial City, Saudi Arabia. The ethyl acetate and butyl acetate plant which will have a production capacity of 100,000 tonnes per annum, is one of the two new plants being built under Sipchem’s phase III expansion programme. Turnkey contracts to build the plants in Jubail Industrial City had been announced earlier. The two Sipchem plants will be the first of their kind in the region, according to officials. The other plant produces ethylene vinyl acetate (EVA) and low density polyethylene (LDPE). The ethyl acetate and butyl acetate plant and port facility being constructed by eTEC E&C, are expected to commence in the first quarter of 2013. The total cost of the project is estimated at around SR350 million ($93.32 million). The ethyl acetate plant will cater to domestic and global markets. Its products will be used as a solvent in the manufacture of inks and industrial fluids and granules. The project will be wholly owned by Sipchem. eTEC E&C is a leading EPC contractor specialised in engineering, procurement, plant construction, civil works and building construction. The Korean contractor has successfully completed a variety of projects over the past 40 years. The firm is taking the lead in advanced and value-added industries such as petrochemicals, fine-chemicals, bio-chemicals, and semi-conductor and LCD material related businesses. 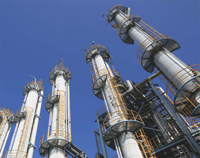 The EPC major has completed a variety of projects in a wide range of petrochemical and coal chemical. It has achieved outstanding growth by cultivating petro/coal chemical plant markets at home and abroad based on its superior technology and sufficient experience accumulated over the past 40 years. “In this respect, we have been solidifying our position as one of the top global EPC contractors while implementing a number of major plant construction projects at home and abroad based on our accumulated technical know-how and experiences in construction and project implementation,” says Nam-hun Kang, a representative of the company in Saudi Arabia. eTEC E&C is reinforcing its global management system with the aim of becoming one of the leading global E&C companies and as part of this strategy, is, aggressively seeking to cultivate overseas markets. “We have earned much recognition for our capabilities in project implementation by successfully completing a number of major projects for our clients in Asia and US and are actively seeking to solidify the base for expanding our presence in overseas markets and localising ourselves to better meet and exceed our customers’ needs and requirements by securing more global strongholds,” the company adds. The global EPC firm established eTEC Arabia in Al Khobar in 2007, an EPC company for oil and gas, petrochemical and infrastructure projects. It also established eTEC Gulf Contracting in Abu Dhabi, UAE to offer various engineering and design, procurement services, construction supervision and project management for the projects in the UAE and the GCC countries. In addition, the fast-growing company has dynamic activities in Malaysia, Indonesia, Vietnam and China having their respective regional offices.